The master cylinder is the heart of your brake system. It contains the fluid reservoir and various seals and valves that push the fluid to stop the brakes. The master cylinder has been a problem area for me. I’ve had spongy brakes, a bad seal, and a leak. Let’s take a look and determine how you can overhaul or improve the performance of your master cylinder. Like everything else on your Heinkel, if your car has sat for a while you will have quite a task disassembling your master cylinder. The best way to start is to take your master cylinder out of your car and putting it in a sturdy vise. Removal from the car is easy; after you take off the brake system cover (I tape it up to dashboard to get it out of the way) you may encounter some difficulty removing the bolt that secures the brake line. Use two 17mm wrenches (one underneath the brake fitting and one on the bolt) to loosen it. Then remove the two bolts at either end that hold the master cylinder in the car. Remember that brake fluid is harmful to paint and take precautions. Even old fluid is corrosive! The German and English clubs sell some parts to repair the brakes. The German club also has a rebuilding service. Replace the seals: The seal labeled #3 is not available. The clubs sell seals that will work but are slightly different alternatives. If you use an English seal, make sure the flat part fits flat against the back of the cylinder. The spring will fit into the recess of the seal. Replace the one way valve and clean the valve housing: An exact substitute for this valve is available. Remove the spring clip holding the valve in the fitting and clean the housing. Take a slightly used (i.e. decreased diameter) Dremel abrasive buff for this task. Make sure you reinstall the new valve with the "cross" section facing up (you'll see what I mean when you take it apart). The theory is that the fluid needs to flow upward through this valve and out to the brake lines. If you remember this you should be able to reinstall it properly. There’s a copper washer on the one way valve. It is approximately 27mm in diameter and 1.5 mm wide, and not available as a replacement part to my knowledge. You can rejuvenate it and reuse it by annealing it, or making it soft again. To anneal it you simply heat up the gasket until it is red hot, then dunk it in cold water. This will soften the copper so it can be compressed and reused. 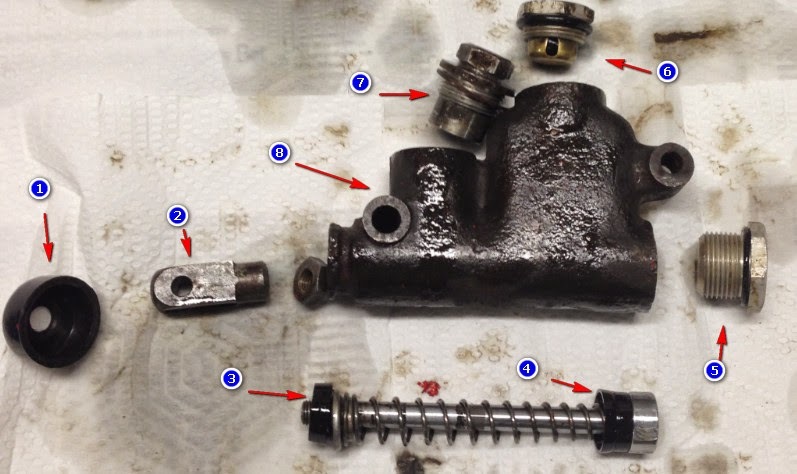 Master Cylinder Body: There's a number of things you need to do here. Cleaning is the most important! The reservoir will have a bunch of dried fluid caked in hard-to- reach places. I find the best way to clean this part is to soak it overnight (or longer) in denatured alcohol. After soaking I use an abrasive buff attached to a Dremel to clean out the now softened old fluid. The bore will now need attention. I suggest using the cylinder hone again to clean this out, followed by a polishing as we did with the wheel cylinder. It is very important that the bore be perfectly smooth- no gouges or dried fluid left in it. Clean and flatten the mating surfaces for the cap and valve housing: You can easily accomplish this with some fine wet/dry paper and a sanding block. Finally you should make sure the compensating hole in the reservoir is clear. Depending on how much crud you have in your reservoir you may not even know that this hole exists! It’s located about 3/8” (15mm) behind the main reservoir drain. You should be able to put a .5mm wire through the hole and into the bore. Cleaning this out is easier said than done, so take your time here. Aluminum Bore Cap: The aluminum cylinder bore cap will probably be caked with dried on fluid. There’s also an o-ring required on the cap that has probably disintegrated. These o-rings are not stocked by the clubs. I suggest going to the hardware store with your cap and getting a suitable rubber ring that fits. Reservoir Cap: This part is not available new, so be careful with it as it might be in bad shape, and you won’t find another. The cap is made of aluminum with a middle section made of plastic. The plastic has a very small vent hole in the top. Tucked up inside the cap is a rubber gasket. While I’m not sure, I think the purpose of the gasket is to prevent fluid from squirting up through the hole. The gasket and underside may be dirty. Do not soak the cap in denatured alcohol; it could wreck the rubber seal. Use brake fluid as a lubricant to ease the seals into the bore. Be very careful that the lip of main seal does not get caught on the main reservoir drain hole and become damaged. Screwing in the big aluminum cylinder plug requires compressing the spring. An easy way to compress the spring to screw in the reservoir cap is to pull the piston rod as if you are activating the brakes. I do this by suspending the cylinder by the rod, pulling down on the master cylinder, and then screwing in the cap as shown in the photo below. Brake Fluid: If you are totally rebuilding your brakes you have an opportunity to change brake fluid. You can switch from DOT3 (alcohol based and bad for paint) to DOT5 (silicone based and not harmful to paint, but costs 4 times more) since you won’t encounter compatibility issues from mixing fluids. I haven’t tried it yet, but I will in the near future on another Heinkel I have. Replacement Cylinders: The German club offers replacement master cylinders on an exchange basis. I tried one because after rebuilding mine as described above I still had a spongy brake pedal. Unfortunately mine was defective after the rebuild and I sent it back. I’ll report on it when I get the “replacement replacement” back. Installing a Sleeve in the Main Bore: Remanufactured master cylinders usually have a sleeve installed in the main bore to compensate for wear. This may be an option for you. The sleeves are usually stainless steel, and can be fitted with a variety of seals and pistons to operate properly. One thing to be aware of is that the Heinkel brake setup accommodates an 8mm rod; you may have to plug and re-tap the brake connector to get a different rod to work.